An endodontist is a dentist who has advanced training to diagnose and treat issues with the inner tooth. This can include its nerves, pulp, tissues, and arterioles. Root canals are one of the most common dental health problems treated by endodontists. Their goal is to save the tooth with endodontic treatment whenever possible. When you have endodontic re-treatment, your endodontist at O.C. Dental Specialists first removes the packing material and crown that you received during the original procedure. An ultrasonic handpiece vibrates the material off your tooth so it is visible to your endodontist. You receive a local anesthetic at the start of the procedure to dull pain and ensure your comfort. The re-treatment procedure is quite similar to the original one. Your endodontist separates the tooth requiring treatment from your gums with a rubber dam. This prevents bacteria and saliva from entering the tooth while you’re undergoing oral surgery. 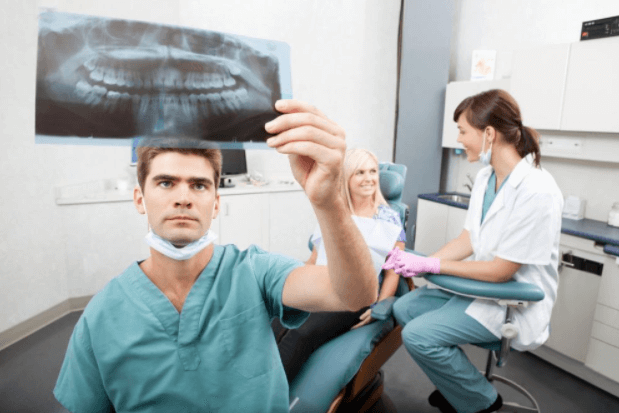 For the next step, your endodontist cleans and re-shapes the tooth, using X-rays to make sure that the roots of your tooth come entirely clean. In cases of severe infection, we may need to cover the tooth with packing materials and clean it again at a follow-up appointment. The packing materials contains gutta-percha, a rubbery substance that helps to keep bacteria and other harmful debris away from the tooth. Please contact us right away if you’re concerned that your original root canal might have failed.